← Tim Tams are back! Today, we had to say goodbye to the best cat we’ve ever known. We went to bed with a cat who seemed fine and woke up to one whose body was shutting down rapidly. We thought we’d have years and years of loving Clair and, instead, we had to deal with letting her go. We’re still trying to figure out how to deal with the quiet she’s left in the house. My only consolation is that two separate vets lost their cats to the same thing and both said that you never see it coming and that it’s fast. She had a massive obstruction in her intestine, most likely adenocarcinoma (yes, I had to look it up), that wouldn’t have been operable, wouldn’t have responded well to chemotherapy, and our poor kitty wasn’t stable enough to survive either, anyway. She was twelve years old and we loved her immensely. I had Clair since my college days. She was the first pet I ever owned, on my own. 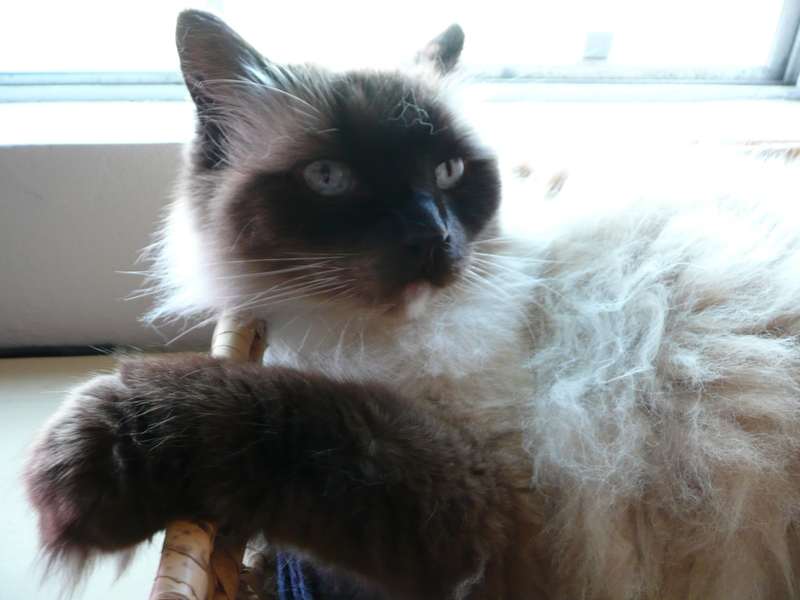 She was a Ragdoll, chocolate pointed, although her white furry toes and white chin spot made her “pet quality” instead of “show quality”. All this meant was that I could afford her more easily. Ragdolls are known as the dogs of the cat world: they come when you call them and are friendly and affectionate. Clair could have been the poster child for Ragdolls everywhere. She always wanted to be where people were; she was always waiting at the door to greet you when you came home. She never ran from company and she would demand attention if you so much as looked at her. If you had papers on the table, she’d know and appear solely to lie on top of them. She was fluffy and cuddly and soft. Clair watched cats and dogs come and go from our household and never so much as meowed in complaint. She took everything in stride, probably because she knew she would always be queen of the household. When Travis moved in, Clair became his cat. He loved her and spoiled her, most likely more than I did. Cat beds showed up in every room of the house. Stools and chairs were placed strategically so she didn’t have to jump so high. Treats and catnip flowed like no other. She was definitely loved and she reciprocated by following him everywhere he went. From room to room, she was like his shadow. Clair loved boxes and bags. Put an empty box on the floor, she’d be in it. Put it on a table, she’d find it. Laundry baskets were equally favored. I think her favorite “bed” was Travis’ suitcase. Anytime it came out for travel, it would be covered in Clair-fur before too long. Clair loved to drink out of water glasses. If you turned your back on your glass, chances were it became hers. If she couldn’t reach the water with her head, she’d dip a paw in. She also loved drinking from the bathroom faucet. Travis would always leave it trickling when he brushed his teeth so she could have a drink. Spoiled cat, I tell you. When the weather turned cold, we knew we could expect some furry company on the bed. She would settle into her cat bed (on the nightstand) when we went to bed, but before long we’d find a tail in our face, a paw on our head, and a rumbling body snuggled between the pillows. The dogs sleep on the floor, but Clair slept anywhere she wanted. We started giving Clair a little wet cat food in the mornings. She, in turn, would remind us if we forgot. I also found out Travis would sneak her some turkey breast meat if he made himself a sandwich. Clair enjoyed being up high; I guess so she could survey her domain. Travis built her cat shelves that led above the television and she would hang out there every night with us. If she was lucky, she’d find a little sprinkle of catnip on her shelf, courtesy of Travis. She only fell off once, after some vigorous rolling around in catnip. We’re having our kitty cremated and we’ve ordered a nice box (definitely not a modestly priced receptacle) for her. It has a place for a photo and it has a little engraved plaque. Maybe we’ll place her back on her cat shelf. You never expect to leave the house with a cat and return with an empty carrier. You never expect how much a little cat integrates into your life. And you certainly don’t expect how quiet a house can be without her, even with three dogs still running around. We miss her so much. This entry was posted in cats and tagged goodbye, world's best cat. Bookmark the permalink. Clair was most definitely the best cat ever. For those few months that I lived with you, I looked forward to coming home every day because she was at the door as soon as I opened it, and would follow me from room to room so I could tell her about my horrible day at work and she could “mew mew mew” as she comforted me. She’s the cat that made Jeff realize that he doesn’t hate cats. He loved Clair. She’ll always hold a special place in our hearts. We are so sorry for your loss. One of the first things I missed about her was that no one was at the door to greet me when I came home. Sure, the dogs were happy to see me, but I had to let them out of their “dog room”. Since Clair had the run of the house, she was always right at the door! Oh Leanne – I’m so sorry for your loss. Thanks… the pups will have to pick up the slack on cute pet pictures for a while now. What a horrible feeling. I’m glad it was quick at least, and that you didnt have to torture yourself with any awful decisions. She sounded like a wonderful companion. Clair was the cat that made people realize they might actually like cats. She was such a wonderful pet. What a wonderful tribute to Claire. From the post, she was well loved and a lovely companion. We should all be so lucky to have a pet like her. Leanne I’m so sorry about your sweet cat! I am allergic so have never owned one, but I lived with a cat like that and they really can be adorable. Your post is a beautiful tribute. Oh Leanne, I’m so late on this and so sorry to read about your loss. Losing a pet is one of the hardest things we’ve been through so my heart goes out to you. My 3 send puppy kisses your way. Thanks… we’ve set up a little spot with her photo urn and some pictures. We’re getting by, slowly.